The normalization doesn’t allow direct comparison of the total cost of the two reactor types. It shows how the costs of a nuclear plant apportion between the various elements of the plant. A brief explanation of the nature of these costs is given below. Direct costs include those construction and installation costs associated with the operating plant structures, systems, and components. Account 21 is the site improvement and all the reactor buildings and the balance-of-plant buildings and structures. The rest of the direct cost accounts are associated with the equipment systems, the equipment itself, and such things as the costs of transportation and insurance, provision for shipping fixtures and skids, startup and acceptance testing equipment, on-site unloading and receiving inspections, and installation. Indirect costs begin with account 91, for construction services, which includes costs for temporary construction facilities at the reactor site, construction tools and equipment, payroll insurance and taxes, and payments to federal, state, and local governments for taxes, fees, and permits. Account 92, for home office engineering services, includes costs of engineering and home office services that are specific to the site. These costs include engineering and design, procurement and expediting activities, estimating and cost control, engineering planning and scheduling, and the services of home office QA engineers and staff personnel engaged in work on the project. Account 93, for field office engineering and services, includes the construction management activities associated with on-site management of construction, site QA/QC, plant startup and test procedures, and the supporting costs for these functions. Account 94 include the owner’s staff for project management, integration, licensing, QA/QC, etc., the initial staffing and training of operations, maintenance, supervisory, and administrative personnel, the initial stock of spare parts, consumables, and supplies, and the initial inventory of sodium and other capital equipment. Controlling indirect costs is of the utmost importance, and those have varied widely from project to project. In past U.S. experience, the indirect costs dominated the direct costs in some plants, with the indirect costs running up to ridiculous levels, actually higher than the direct costs. Interest on the borrowed capital kept adding on as plant construction was held up by one legal challenge after another. 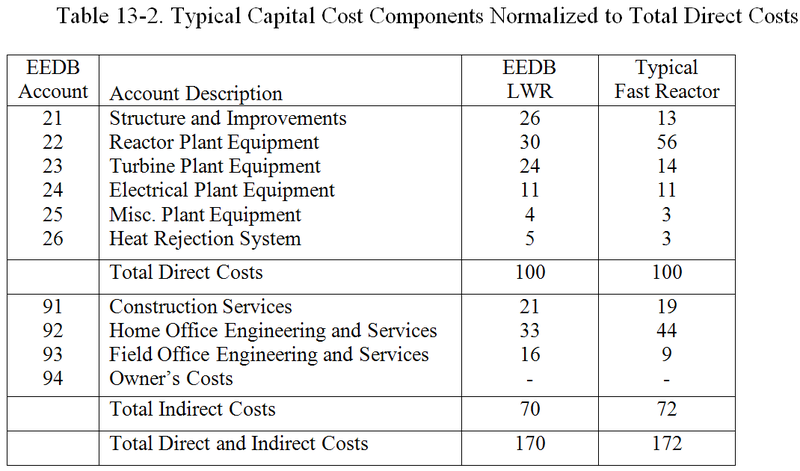 A key to capital cost competitiveness for the fast reactor, as for any other, is keeping the indirect costs down to a reasonable level; in particular, construction hold-ups cannot be tolerated. In maturity, there is no reason why the indirect costs for fast reactors would be any higher than those of LWRs. As for the direct cost components, the reactor equipment cost may be higher for the fast reactor because of higher-temperature structural materials and additional equipment associated with the intermediate heat transport system. On the other hand, the containment building and structures can be reduced in size and in the commodity amounts, because high pressure containment is not required for fast reactors. The balance of the equipment systems, such as the turbine, could be slightly less for fast reactor because of a higher thermal efficiency and hence reduced thermal output for any given electrical output. On balance, the capital cost for fast reactors should be in the same range of variations that exist for LWRs. In a recently completed commercial feasibility study done by the Japan Atomic Energy Agency, the capital cost for their 1,500 MWe JAEA Sodium Cooled Fast Reactor (JSFR) was estimated to be less than that of an equivalent size PWR. [10-11] A significant reduction in the construction commodities and building sizes was achieved by a number of design changes, such as combining the IHX and pump into one unit, shortening the piping length with advanced alloys, and reducing the number of loops with large components. Overall, though, because of first-of-a-kind costs, capital cost competitiveness is unlikely in the first few fast reactor plants. Too much focus should not be placed on the capital cost reduction for the early reactors. Risk in terms of large sodium component reliability and system engineering is more important than the economies of scale that push toward larger reactor sizes. Initial fast reactors should be in the range of 600 MWe sizes before scaleups begin. Economies of scale will naturally push to a larger size in a mature economy. Even for the mature LWR industry, the reactor size has been in the 1,000-1,300 MWe range and the scaleup to 1,500-1,800 MWe size is only now being planned for the next evolutionary plants, after thousands of reactor-years experience with the current generation. Most importantly, fast reactor design should exploit inherent properties of sodium and inherent safety characteristics so that the system as a whole is highly reliable, easy to operate, and has assured longevity. Favorable economics will follow in a mature fast reactor economy. If the first commercial plant isn’t cost-competitive, initial deployment will have to be driven by considerations of national policy, prudent planning, resource scarcity, perceptions of future costs, and other such factors. Capital costs for the initial few reactors will be dominated by indirect costs, and it is crucially important to establish a project infrastructure that contains them. The EBR-II project model had a small cadre of experts (less than one hundred) who were fully responsible, from the initial concept through engineering, detailed design, procurement, installation, and final acceptance testing. A modern fast reactor, whatever its size, will require a somewhat larger cadre, but expertise is paramount, and in size it should be on the order of few hundred engineers only. A sound project organization is vital, not only for the success of the initial demonstration project, but also as the model for construction infrastructure in maturity. L.J. Koch, “Experimental Breeder Reactor-II: An Integrated Experimental Fast Reactor Nuclear Power Station”, Argonne National Laboratory. Typo, it was originally expressed in mills/kWh and I converted the first but not the second. FYI…very small factoid. “Mills per kWh” are standard within the “industry”, that is in terms of the “ISO/energy trading industry”. No one uses cents or dollars because trading is done in mills. I’ve always hated it when I come across it because I have to translate it in my head to cents and dollars, so I’m glad Barry fixed this. Current nuclear reactor capital costs are driven by costs mandated by nuclear regulation. Dr. Bernard Cohen, after considerable study, estimated that US NRC nuclear regulation was responsible for increasing the cost of a US built commercial nuclear reactor by 400% between 1973 and 1989. If regulation is such a strong price driver for the cost of new nuclear reactors, can we hope to evaluate IFR capital costs without knowing specifically what regulatory standards will apply to there construction and licensing? (Regulatory ratcheting, quite aside from the effects of inflation, quadrupled the cost of a nuclear power plant). What is a “mill” inside the US, is just a millidollar in International Units. Expressed in m$, costs are floating point numbers and much easier to calculate than dollars-and-cents. Thus “5.5 m$/kWh” scales easily to “5.5 $/MWh”. A value in millidollars can be used in any arithmetic where the significant multiples are in thousands. India is where the fast reactor could become a regular power generation system first. First two large PWR’s with capacity of 2000 MW are likely to become operational this year. They are estimated to cast Rs 14o billion or Rs 70,000/kW. PFBR (500MW) is expected to be completed shortly in the same South Indian state of Tamilnadu at a cost of Rs 32 billion. Both are FOAK for India. This document compares the costs of IFR and LWRs in the US. Actual cost are so close that the decision will depend on political considerations alone. A quite nice insight into the issues of QA/QC and the difficulties in costing. However I’m still interested in a more detailed, component based breakdown cost estimate. Clearly the above tables indicate some important things. – structure and improvements cheaper. Lower pressure system, thinner components, no large pressure based containment. Makes sense. – a more expensive reactor system. Fast reactors may have more expensive controls and safety. Sodium requires engineered highly reliable safety and isolation systems. Higher temp materials cost more. Makes sense. – Lower fuel cycle cost. Metal fuel, cheaper to fabricate, higher power density. Makes sense as well. – Turbine plant and heat rejection system cheaper. Higher temp, compact turbine, less heat to electricity required. Makes sense. – Home office engineering and services more expensive. This I don’t get. Why is it higher than LWRs? First of a kind costs? Or intrinsic (ie engineering) cost related? Now I’d like to see more detailed cost breakdown of specific equipment, like the heat exchangers, steam generators, sodium engineered safety related costs, vessel, control system, pumps, containment cost, passive cooling system cost, etc. I’ve recently came across some info regarding the overall cost of nuclear power plants (http://browse.oecdbookshop.org/oecd/pdfs/free/6600031e.pdf). 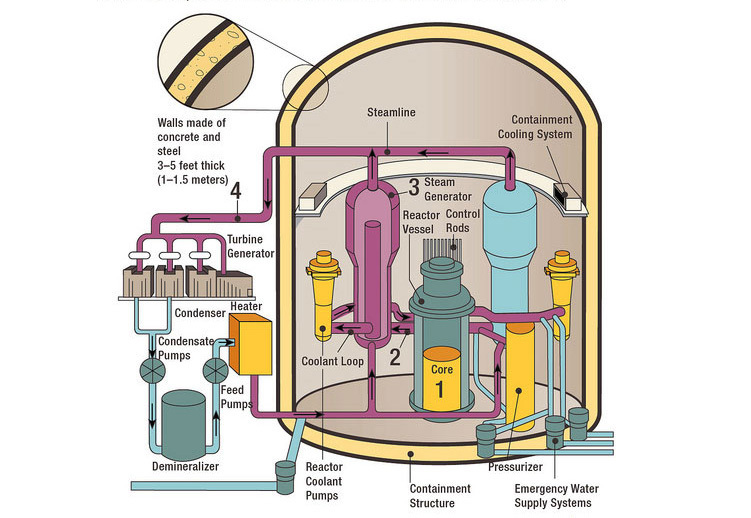 At page 40 (42 in the pdf), you get a good breakdown of the reactor, steam system and electrical system cost. The 2 biggest cost I’ve saw are the reactor stuff and steam system. They do scale in cost with the size of the plant as you can see on page 32 (34), but the turbine system does not scale so good (75% increase in cost for double capacity). There is another interesting image at page 34 (36). There is one way to reduce the costs and the fire risk-replacement of sodium as secondary coolant with a Sn-Pb eutectic. The secondary coolant has very little exposure to neutrons in the core. A cheaper coolant with lower fire risk due to exposure to air or water is useful. Reduction of cladding by replacing the traditional bundles with metallic spheres of fuel in tubular containers and voids filled with good heat conducting aluminium. If aluminium melts, the heat conduction will be supplemented with convection. Fabrication effort and costs will be reduced. Higher fissile inventory is often given as an argument against fast reactors. The world has enough fissile awaiting disposal. A uranium producer like Australia could go for enriched uranium. Sn-Pb is a quite excellent secondary coolant for an IFR. The biggest downside is that it is corrosive to iron and nickel, so you need fancy molybdenum or niobium liners. And while you’re doing that, might as well go for a pure lead coolant for the primary loop in the first place.